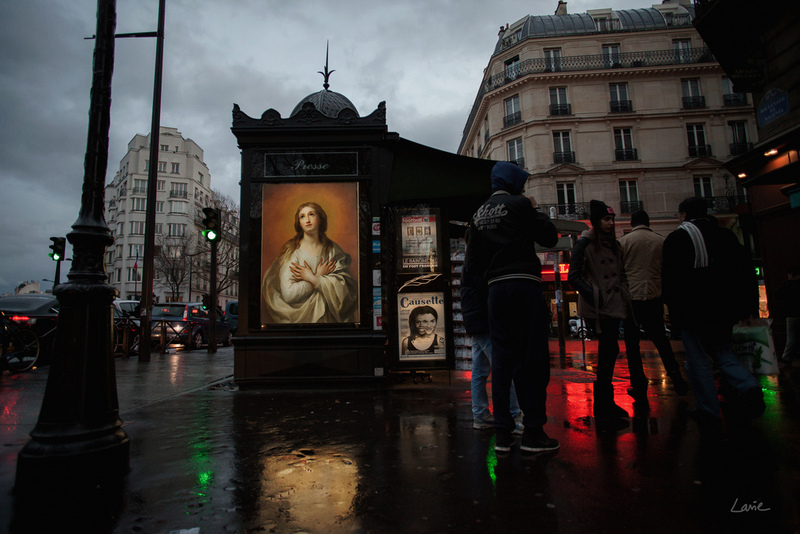 Classical paintings replace advertisements on Paris billboards in "OMG, Who Stole My Ads? "—a series of provocative photographs by French artist Etienne Lavie. The project recalls last summer's "Art Everywhere" program in England, led by Innocent Drinks co-founder Richard Reed, which saw reproductions of 57 popular works replace ads on 22,000 out-of-home ad sites, including billboards, bus shelters, tube stations and office buildings. Lavie's initiative operates on a smaller scale, and since it lacks establishment support, can perhaps be more readily parsed as an artistic statement rather than a corporate project that just happens to involve paintings and ads. Lavie's strikingly composed pictures achieve some amazing juxtapositions—the flowing lines and muted tones of the artwork contrasted against harsh urban geometry and vehicles in blurred motion. The images inspire all sorts of interpretations. On the one hand, they suggest the city and commerce are transient, in a state of flux, while the paintings (and by extension, the deeper concerns of the human spirit) are immutable. Conversely, one could argue that the city continues to live and evolve along with its ever-changing ads for Evian and Peugeot, while the artworks are anachronisms that leave no lasting impression, except perhaps in the images created by the artist. In the end, Lavie achieves a stirring effect on the canvas of viewers' imaginations and sensibilities. And if my analysis sounds like over-thought "blah blah blah," well, judging from Lavie's website, I don't think the artist will mind. More images below. Hat tip: @luckthelady.